The worsening condition of local forests and rivers, and decreasing numbers of wildlife, emerge as key concerns of the four communities. One narrator in Tiltepec (Mexico 3) ascribes the changes to incomers: "Before these people came - well all that side was a forest and there were many wild animals there. According to what people say, one single person from La Luz [a new settlement] managed to kill 25 tapirs (large, odd-toed mammals) and today - well, we don't know what these animals are like any more. and wild turkey, they were seen before but aren't so many now.wild pig [was] everywhere in our forest, which used to be dense." He acknowledges that the indigenous population also bears some responsibility and goes on to say that, if something is not done, such animals will be unknown to future generations: "If we remain with our hands in our pockets (doing nothing), our children who come after us won't even get to know what a wild turkey, a chachalaca (literally, chatterbox; long-tailed, ground-dwelling bird, Ortalis vetula), a squirrel or a deer looks like. No, because we're going to kill them all." Exploitation of the forest needs to be balanced with conservation he continues: ".when our forefathers were here, well, they weren't interested in selling the wood to get money. They were more concerned about looking after the forest; they didn't cut it down, they protected it, unlike us today." This view is echoed by a resident of Yavesía (Mexico 8). He lists "animals that are in danger of extinction like the macaw, the white-tailed deer and the Cardinal bird". Indeed, he says, "there are some that are almost only in books now.there were a lot of macaws before, there were many [birds] that I can't remember now, that we used to see before and they did damage to the sown fields but not any more." Several narrators describe hunting exploits of the past. One man from Ixtepeji (Mexico 21) talks of hunting with no mention of controls or limits: "Well, the only one I didn't kill was the mountain lion (puma).I saw it, but I couldn't shoot it. But there was a man who did kill one of those.its meat is very good, we ate it. zorrillos (skunks), tlacuaches (Mexican possums) and armadillos, those - yes, I killed a lot of them." A narrator from Ixtlán (Mexico 15) expresses the view that controls are needed: ".with the destruction of our forest, the vegetation, fauna and animals, we are destroying everything that we have. Hence we need to implement a programme, a plan, something that is attractive to everyone in the community so that we look after the animals. Instead of hunting them without control we need to establish a better system.and continue protecting the animals, our forests and everything that exists within them." In Tiltepec, a narrator advocates active collaboration with state environmental agencies: ".there are many government institutions where they have banned hunting and deforestation and we have to talk with these people..." (Mexico 3). But it seems attitudes must change too: people talk about conservation of the forest but do not necessarily do anything about it - they are, suggests another resident of Tiltepec (Mexico 9), not really sure what to do: ".when the people from SEMARNAP (Department of the Environment, Natural Resources and Fisheries) came. they said everybody must conserve, everybody. Yes, yes, we said, but what happened is that in the meeting we said a lot of nice things and [after] arriving home they took their chainsaws.We just talk about conservation and we take our axes and cut down trees; the people who have dogs go hunting and that's not conservation.we don't know how to comply." The Zapotec have traditionally a close relationship with nature, in which religion plays a significant role. The lord of the mountains, a Zapotec deity known as Guzio, is said to live within the Sierra Norte, and to take care of the mountain people and their resources. One narrator from Yavesía (Mexico 14) argues that the incentive to conserve is growing as people make connections between the over-exploitation of nature and various natural disasters: ".we've almost had two years of most tremendous heat that's been experienced here in the community, and I think that the people have been thinking about things because of that, and well, because of television, the radio. They've heard about the disasters that have happened recently, what happened in the earthquake (in September 1999). maybe these have been a punishment from God for destroying nature, so there is a panic because now nature is punishing us too". Recently, conservation efforts have been initiated in Yavesía with some success: "There's a strong relationship with nature here, and the village has looked after its natural resources. The recent droughts of 97-98 made the importance of looking after the environment known, because they saw, felt and lived it and we saw that the flow of water in the river went down a lot" (Mexico 12). Some communities are creating special conservation areas: "Well, mostly we have the idea of protecting the [natural conservation area]. because of the water below the surface. 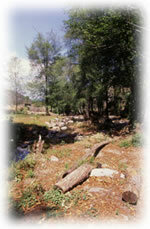 and to avoid participating in exploitation of the forest, and in order to take care of the forest and the ecology of the place" (Mexico 20). Ixtepeji has created a new community reserve dedicated to eco-tourism, with young people training as guides. "When I arrived here...about 27 years ago.it rained a lot then. I mean sometimes it could rain for up to 20 days, day and night. We couldn't do anything. Well it doesn't rain much now, a night or two and that's it, just two or three days. It's changing now [because of deforestation]. When I lived below La Luz, there was still forest they hadn't cut down yet, a little later they finished it off." "I began [hunting] at the age of 14. What I shot the most were rabbits and squirrels, chachalacas (literally, chatterbox; long-tailed, ground-dwelling bird, Ortalis vetula), perdices (Great Tinamou, a type of bird).foxes. [also] comadrejas (weasels), mapaches (raccoons), colapintas (literally painted tail; type of wild animal) and cacomixtles (small nocturnal animals with distinctive long black-ringed tail, Bassaricus astutus). Those I killed too, but by the light of a lamp, not at day but at night.I killed [deer], I can't say exactly how many, but around 300." ".they say that before there were many animals, but now there almost aren't any, because as I was saying people are always killing them and well, that is where the animals are disappearing, yes. They say that there are a lot [of tapir - large, odd-toed mammals] but we never see them any more. [and] wild pigs, we almost don't see them now." "Every village has its own river and people took good care of their rivers and forests; and we - as we are living today - well, nobody knows what respect and fear is. Now they go into the mountains and rivers in any way they like." "There were years when, for example, the corn and fruit harvest were very bad and the people said that it was because the weather was changing. There were many problems and it was said that that's where the importance of looking after the resources lies, because it is the only way that it is possible to have water, to have air, to have animals to hunt and to eat. These were two main factors that helped to unite the village: the work of the municipal authority in the last three to five years and the crises, the environmental crises, the droughts". ".at my age (72), I am realising that we have to take care of nature, of the animals as well as the trees. It is true that.we have lived from this for a long time; but now, times are changing. I would like there to be an office, a new organisation that could give opportunities to the young people who are growing up now, so that they don't exploit the trees too much, and so that they think of another way of life.look for the other means [of livelihood] that I believe are there. But we need good advisors who can lead us along a good path, so we can stop exploiting nature." ".there aren't as many [animals] as before. I think that other people come that go after them to kill them; but people here in this village don't go after them, they just kill them when they chance to see them. I think that it's also because they've cleared the land round here. They are alive - it's not that there aren't any, there are some, but further away." "Yavesía has its own means of living, including many people migrating to the USA. Since before we can remember. the village has never looked to exploitation of the forest because nature gave it for us to live in, not to destroy. at times many people only live in the present.without thinking about what will happen in the future.they haven't protected; [they] never looked after nature so they've damaged their own land."